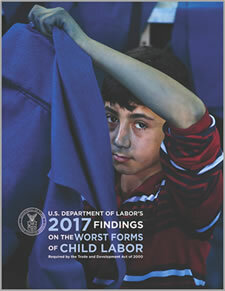 WASHINGTON, DC – The U.S. Department of Labor today released two reports that shine a spotlight on child labor and forced labor in nations around the world: the eighth edition of the List of Goods Produced by Child Labor or Forced Labor and the 17th annual edition of the Findings on the Worst Forms of Child Labor. 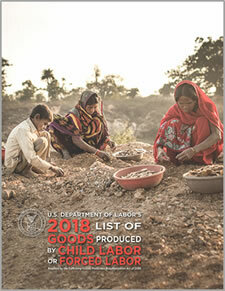 These reports, prepared by the Department's Bureau of International Labor Affairs (ILAB), highlight specific sectors in which child labor or forced labor persists in foreign nations, and describe the progress some countries have made in upholding their international commitments to eliminate these practices. "These reports represent one of the Department of Labor's key contributions to the global effort to protect workers in the United States and around the world by defending the rights of all people to live free of child labor, forced labor, human trafficking, and modern slavery," said U.S. Secretary of Labor Alexander Acosta. The List of Goods Produced by Child Labor or Forced Labor, mandated by the Trafficking Victims Protection Reauthorization Act, includes one new country, Eswatini (formerly known as Swaziland), and ten new goods (amber, bovines, cabbages, carrots, cereal grains, lettuce, mica, peppers, sheep, and sweet potatoes) from particular countries that the Department of Labor has reason to believe are produced with child labor or forced labor in violation of international standards. This edition also features the removal of cotton from both Paraguay and Uzbekistan that had been produced by child labor previously, sugarcane from Panama previously produced by child labor, and physic nuts from Burma that had been produced by forced labor previously. The Findings on the Worst Forms of Child Labor, mandated by the Trade and Development Act of 2000, is the most comprehensive research product on the state of child labor worldwide. This year, the report uses more stringent criteria to assess the efforts of 132 countries and territories to address child labor. Only 14 countries – including Colombia, Paraguay, and India – met the new criteria for "Significant Advancement," which this year requires specific legal and policy labor standards to be met. Nearly two-thirds of the more than 1,700 suggested actions in this year's findings report relate to the need to strengthen laws or improve the enforcement of such laws – highlighting the substantial gaps that remain worldwide. Similarly, the list identifies efforts made in select countries such as Paraguay, Brazil, and Uzbekistan, among others, to combat child labor and forced labor, and offers recommendations to countries seeking to end such practices. "These reports provide information on nations that are making progress in adhering to international labor standards, as well as nations that must do more to end abusive and immoral labor practices," said Martha Newton, Deputy Undersecretary for ILAB. Recent International Labor Organization estimates show there are still over 152 million child laborers – one in every ten children – and 25 million forced laborers worldwide. By pinpointing specific industries where child labor and forced labor occur, these reports provide vital information to governments for targeting appropriate policy responses and to businesses for directing resources to support due-diligence and risk-management systems. To help employers around the world do their part in ending child labor and forced labor, the Department is releasing an updated version of the Comply Chain smartphone app, which is now available in French and Spanish. This easy-to-use tool, which is available for download on both iOS and Android platforms, provides companies clear and detailed guidance on how to develop robust social compliance systems in their global supply chains. It assists them, including their suppliers, in identifying, rectifying, and preventing labor abuses in the goods they produce. The Department also released an updated version of the Sweat & Toil app, which contains the reports' information on goods produced by child labor or forced labor, and the latest findings on governments' efforts to address child labor. It makes thousands of pages of data portable, searchable, and accessible from every corner of the globe. More information is available at www.dol.gov/EndChildLabor. Printed versions of the reports are available from ILAB's Office of Child Labor, Forced Labor and Human Trafficking, 200 Constitution Avenue NW, Room S-5315, Washington, DC 20210. Inquiries may also be made via telephone at 202-693-4843, fax at 202-693-4830, or email at GlobalKids@dol.gov. The mission of the Department's Bureau of International Labor Affairs is to promote a fair global playing field for workers in the U.S. and around the world by enforcing trade commitments, strengthening labor standards, and combating international child labor, forced labor, and human trafficking. For more information about the Department's work on these issues, visit http://www.dol.gov/agencies/ilab.